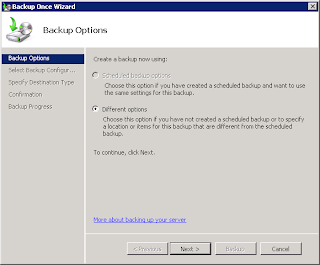 It is easy to restore a user mailbox in Exchange 2003 after its deletion, if the deletion retention settings are configured properly in the Exchange prior to the deletion of the mailbox. 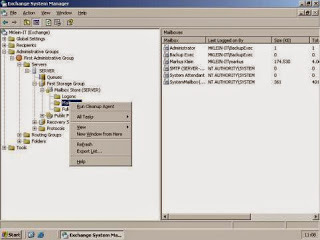 Here we will show you how to configure the deletion retention settings, and how to restore Exchange 2003 mailbox. For this, one needs to make use of the Exchange System Manger. Exchange System Manager is a specialized MMC console that facilitates better management of the Exchange Organization. It helps Exchange administrators in managing public folders, servers, routing, and policies very effectively. 1. Start the Exchange System Manager. Note: If you do not see the Administrative Groups displayed, Right-click < organization>, click Properties, click the Display administrative groups checkbox, click OK, click OK, and restart the Exchange System Manager. 5. Click Properties, and then click the Limits tab. 6. Enter the number in Keep deleted mailboxes for (days) box (the deleted mailboxes will be kept for this number of days); click OK.
1. Repeat the steps as above till the step 4. 2. Right-click Mailboxes and click Run Cleanup Agent. 3. Right-click the mailbox that is to be recovered, and click Reconnect. 4. Select the user account (when the list of Microsoft Active Directory directory service accounts appears) to which the mailbox is be connected; click OK.
5. Finally, quit Exchange System Manager. Kernel for Exchange Server is a professional third-party tool for the recovery of deleted Exchange Server mailboxes. Apart from the deleted mailboxes, it recovers all other inaccessible mailboxes from the corrupt or damaged Exchange database. Another advantage is that, it works with all versions of Exchange Server.